When the CSG company Metgasco first began its operations in the northern rivers it was singing a sweet song of social license. How those words have come back to haunt them. More recently the CEO is apt to use threats of prosecution against protesters as he becomes increasingly shrill in his condemnation of the local opposition. This is just a symptom of Metgasco’s desperation, they have no social license and they know it. 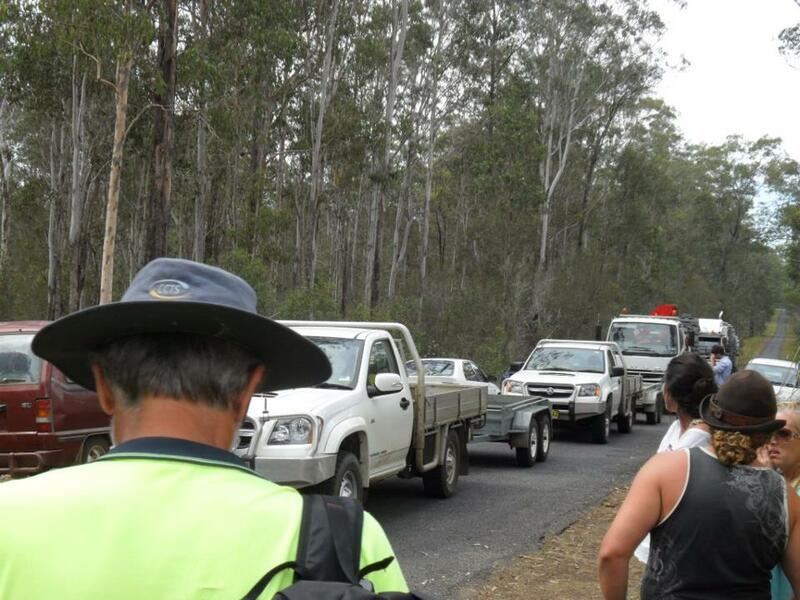 The truth is that Metgasco can expect protests to follow it everywhere it goes. The Northern Rivers community is united and determined to stop Metgasco. You could be forgiven for feeling the smallest amount of sympathy for Metagsco’s investors. The company is the meat in the sandwich between an out of touch state government that is determined to break the community’s will over CSG and what is probably the most organized, determined and united regions in the country opposing the industry. Almost all of Metgasco’s exploration area and potential gas reserves lie within the hotly contested Northern Rivers area where reliable polling is showing around 90% opposition to unconventional gas mining across all of the local government areas. It would be safe to say that Metgasco’s gas reserves are rapidly becoming what is known in industry circles as a ‘stranded asset”. The battle for the northern rivers promises to be a dramatic one. Many see it as a make or break battle for the whole industry in NSW. A company with nowhere else to go faces an ever growing protests movement in one direction and market forces in the other. If it is a fight to the death, no prizes for guessing whether it’s the community or the company that will fail first. These locals are numerous and they are determined to protect their region and they are not inexperienced. The Northern Rivers led the way in forest protests in the 1970’s and again in the 1990’s with the successful Nightcap and North East Forest Alliance campaigns. This time around it’s CSG but the movement is bigger than ever. Where the forest protesters were only ever relatively small in numbers, this is not the case with csg. Nor is this regional population uneducated. The Northern Rivers has one of the highest per capita concentrations of PHDs and boasts an impressive honour roll of some of the country’s more experienced activists. Add to this a huge broad scale mass movement comprising farmers, business people, and supporters from across the entire party political spectrum, literally the 85%, and you have a powerful mix. The regional group CSG free northern rivers has been preparing the ground for a big battle with its uniquely comprehensive consensus building model, the ‘gasfield free community strategy’. 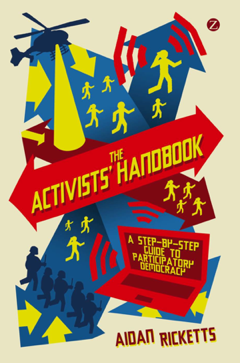 There’s a lot involved, but in a nutshell, an ever expanding network of communities are engaging in a very grassroots mobilization process that actually involves reaching to every household and building consensus to keep gas companies at bay. The Northern Rivers now has over 70 communities across all local government areas signed up into “Gasfield free communities” and the comprehensive neighbor to neighbor surveys are yielding surprising results. In 70 communities comprising over 12000 households the anti csg vote remains in 90 percent range. These results are independently verified by the AEC run Lismore poll in September which recorded a massive 87% opposed to unconventional gas mining across the entire Lismore LGA. Figures like this are as close to social consensus as you can expect to get. These communities are not just united; they are also actively involved in non-violent direct action training and are pledged to mutual aid in the event of gas company incursions. We are just beginning to see the first signs of this at Glenugie near Grafton where local residents instituted a community vigil in late November to keep gas company Metgasco at bay. After a Mexican standoff of several weeks the trucks rolled in on 4th December. 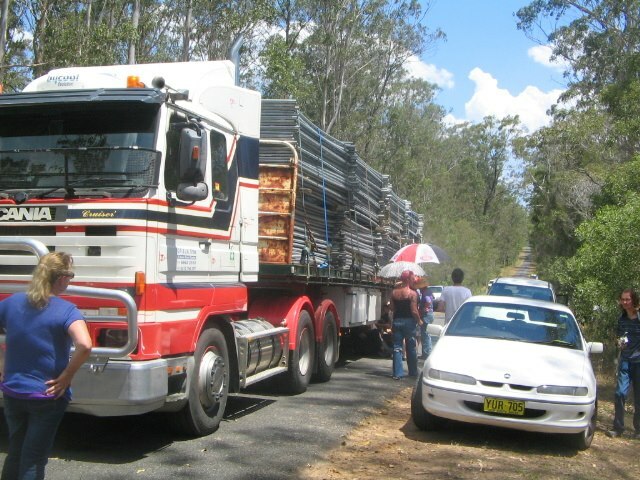 Within hours numbers had swelled to over 80 people, 5 trucks were stopped and by mid afternoon a protester was sucessfully locked on to a vehicle. Metgasco is hoping the force of the Crimes Act and the Petroleum Operations Act will be enough to deter these kinds of actions, but the word on the street is that there are an ever growing number of people quite prepared to risk arrest to stop this company. Non-violent protest including voluntary arrest is a time honoured part of the tradition of civil disobedience practices by great leaders like Martin Luther King and Ghandi. Our courts have a long history of recognizing the role of the conscientious objector, the police are familiar with people locking on at protests, and it’s all part of a healthy democracy. What these protesters know is that each blockade costs the industry dearly in the court of public opinion, and probably even more dearly in the eyes of nervous investors. These communities are in for the long haul and already expect to lose many individuals battles to win this war. As they say up here, this is not just the fight of our lives this is the fight for our lives. Non-violent…non-negotiable.! The question is how long can the company and its investors hold the faith. dood – love the articel – small typo. “PHDs and boats an impressive honour” missing an ‘s’ I think. These companies don’t know what they are in for! Here in Tassie, we know exactly what you are going through up there, and I am sure everyone here wishes you the best and would offer any support they could. Even if it’s only cyber campaigning from a distance….it is getting the truth out there. Well done on your integrity. Great article, well said Aiden.